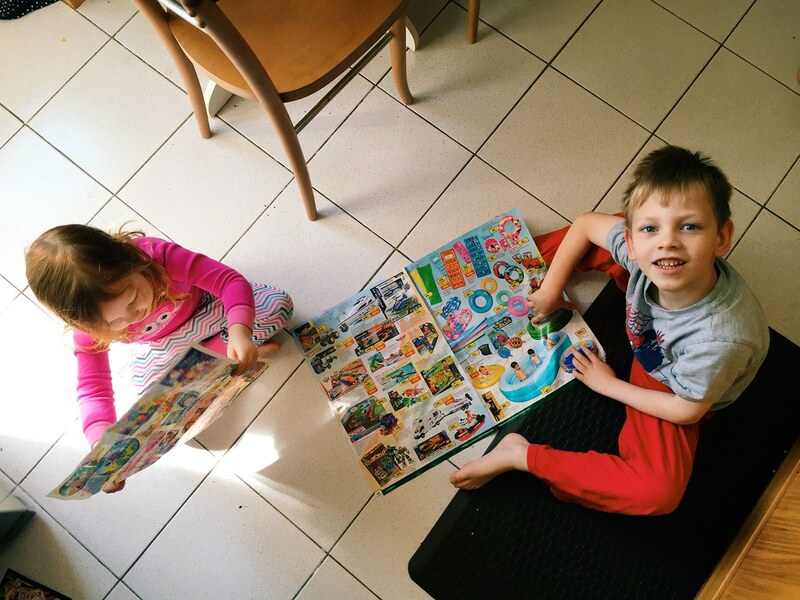 I found the kids this morning sitting on the kitchen floor “reading” the newspaper (shown in the photo above). Actually, it’s not a newspaper, but an advertisement for a kids store here in Czech and apparently they found a few things of interest and were spending time talking about what they wanted to buy. I took this photo because in my mind they were just some old couple hanging out on a Saturday morning, drinking coffee, and reading the paper. Every few seconds Avery would say, “Can I get this one?” and point to some Disney princess thing and Titus was finding every Lego item on the page saying that’s what he was going to buy. We’re actually trying to teach them about money and how to save and think about things so we’ve been giving them “jobs” around the house which pays a few Czech crowns. It’s all really fun until they realize they don’t have enough money to buy the things they want and then the tears start flowing. It’s all part of the learning process. As for the rest of the day we really just spent time cleaning and hanging out as a family. It was nice to get some things back in order and have the kids help clean up and do a little work around the house. We’ve had this annoying baseboard in our living room that kept coming off so I finally got some glue that I’m hoping will keep it on. We made it through all the dishes and I’ve got another load ready to go, and Bethany has been working on cleaning the sheets and getting the kids’ room a little more orderly before Papa and Nana come next Sunday. Speaking of Papa and Nana, we also spent time with them over Skype/FaceTime this evening as they prepare to fly next Saturday for their first trip to our place in Czech. They are mostly coming to help with the new baby, but we’re hoping to get them out to see some of Europe if we can. They are also bringing us some American goodies which will be fun too! OK, that’s all for today. We’ll see ya tomorrow! Hi Shay & Bethany, I started following you on instagram a couple months ago and quickly discovered your blog; I was drawn to the images of Prague as I had just returned from my own trip to the Czech Republic. 🙂 Now, my husband and I are exploring an opportunity for us to move to the Czech as well (separate from JV), and I was wondering if we could connect with you via email or Skype? We’re trying to reach out to all our resources for guidance and wisdom; we’d love to hear from another American couple who has done this before. I didn’t see a contact email or anything listed on here, so I hope it’s okay I’m posting this in comments. Would you be game to connect? Thanks for your time!